Halloween is an ancient festival with Celtic origins, traditionally believed to be the day on which the souls of those who had died that year progressed to the underworld. Following America’s lead, Halloween has gained massive popularity in the United Kingdom (UK) in recent years, turning into one of the country’s biggest cultural and commercial events. The prevalence of Halloween traditions, such as wearing costumes, trick-or-treating and carving out pumpkins, have led to large amounts of consumer spending. This spending has been increasing annually and is forecasted to reach a total of 419 million British pounds in 2018. The most purchased products for Halloween in the UK are chocolate and sweets, with 40 percent of shoppers buying such goods in 2017. Fancy dress purchases are also popular among consumers, with sales of clothing reaching an estimated 166 million pounds in 2017, the largest amount among the various spending categories. Halloween decoration and entertainment sales were slightly lower, at 99 million British pounds and 77 million pounds, respectively. Despite the well-known tradition of carving out pumpkins on Halloween, less than 20 percent of shoppers bought a pumpkin last year. Across the UK, average spending on Halloween varies depending on the city. Residents in Brighton are most generous when it comes to buying Halloween treats, spending an average of 18.60 British pounds. 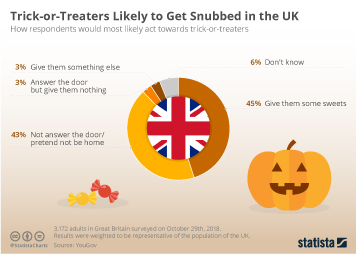 In comparison, the population of Hull only spends 1.70 British pounds on sweets for Halloween trick-or-treating, on average, the lowest amount across the country's major cities. Topic: Halloween in the U.S.